It was my last day in Detroit and I made a visit to Don Yeyo Cigars in Dearborn, Michigan. Arturo was working that day and just got in a new shipment of cigars. He asked me if I ever tried the CAO Pilón yet. I have heard of it but never smoked it. He said you are going to love this smoke. The box alone impressed me with its double lid design and the explanation of what a Pilón is for those that do not know. The scene was the tobacco barns of late 1800s Cuba. Skilled men called piloneros were masters of a slow, 18-month long fermentation technique using round pilons. This method involved hemming tobacco leaves together and stacking them, layer by layer, in a circular pattern. While building and tending to the round pilon took as much patience as it did skill, this method of natural fermentation maximized the flavor and color of the leaves. But time marched on, less costly fermentation methods were explored and the standard rectangular pilon was born. The price point on this cigar should make anyone wnat to get their hands on it ranging from $6.00 for the Corona up to $7.25 for the Churchill. I think I paid $7.00 for the Robusto and that is with the Michigan State tax. The CAO Pilón has gorgeous toothy Ecuadorian Habano wrapper with some glistening to it when held up to the light.The binder and fillers are all Nicaraguan. It is capped with a slightly darker leaf than the wrapper itself. The packing is tight with no soft spots along the barrel. It has a sweet tea and hay aroma with no pepper tickling the nose. Once clipped the cold draw has an orange zest to it with a growing peppery spice as I roll it around. Ok; sweetness on the foot and pepper on the head, one can only can imagine what will be in between. I roll it around a little more savoring the pre-light flavor and examining the band that adorns it. The band is actually very informative with a sketch of a Pilón on it, the blend is clearly defined by wrapper, binder, and filler. The size is clearly stated 5×52 Robusto. No mistaking what you are smoking here. In case you did not know, Rick Rodriguez created this cigar, it says so, right on the band. Finally, the top of the band declares the Pilón as Lote Pequeno whihc translates into “Small Lot”. So there you go, everything you need to know about the cigar is on the band. I decided this cigar would be enjoyed in the solitude of the Stogie Press lounge over the weekend, so I can enjoy and savor the flavors I am told it will deliver. 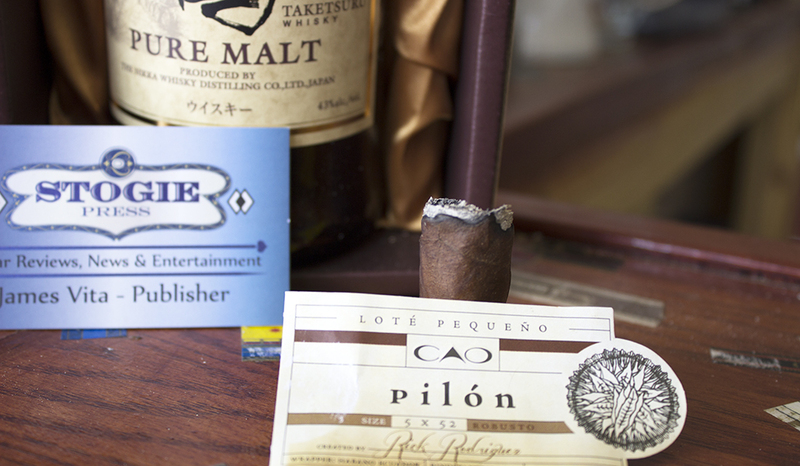 It was now time to toast it up and see what the CAO Pilón offers my palate. First notes are that of the orange zest, coffee, and nut. The retro-hale is fairly smooth with just a smidgen of pepper on the nose and a touch of cooking spice. The smoke production becomes full rather quickly with a creamy texture. 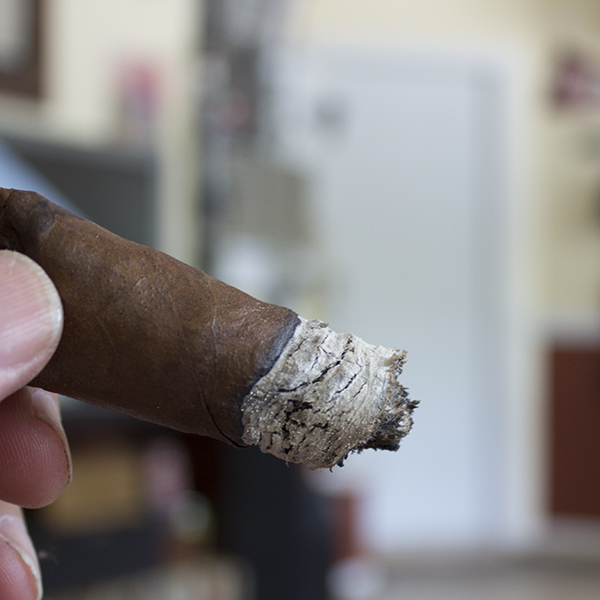 The ash is medium grey resting on a thick char line and the wrapper is doing what one expects from all that tooth – oiling up! Some cedar fills out the early profile joined with a peppery aroma. The wrapper is bursting with oils and glistening in the midday light in the lounge. Approaching the end of the 1st third there is a sea salt and butter component that enter the mix. Damn good cigar so far; definitely a slow burner with plenty of palate pleasing smoke. The only issue I have so far is is gets a little hot to the touch but the smoke is cool. Into the second third a dried fruit flavor enters with a long finish melded with a bitter coffee. The burn has been spot on with a well-developed ash. The aroma starts to change to more of a nut. The last CAO I enjoyed this much was the Columbian that was released in 2014, the Pilón certainly ranks up there with that. The strength is a solid medium and the flavors are now dancing about, with the sea salt and nut moving in then the cedar and fruit. Back and forth they go as if they were dancing a tango on my palate. The retro-hale is smooth in this effortless smoke. The ash finally fell at the half. The flavor continues through the remainder of the burn. The strength surprisingly picks up to a solid full at the end. 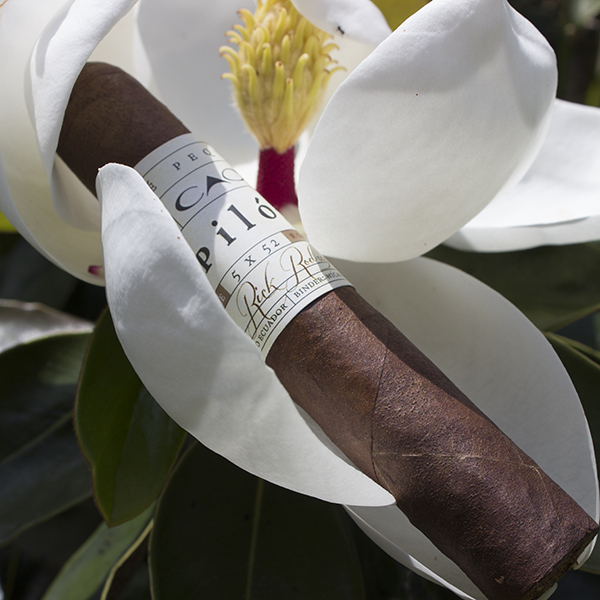 Overall the CAO Pilón is a terrific cigar with solid burn qualities and flavorful smoke. The ash holds tight to form and the smoke is full and smooth. It burns slow but does get hot to the touch. I would most ceertainly recommend this to most cigar smokers but if you are one to shy from a full strength smoke, I would caution you on smoking into the final third. This entry was posted in CAO, Cigar Review and tagged CAO, CAO Pilon, cigar review, Don Yeyo Cigars, general cigar. Bookmark the permalink.